With stylish design, smart controls, and professional sound, the Sennheiser Momentum True Wireless earbuds are a great cordless alternative to those fed up with trailing cables or wired remotes. It's hard not to recommend the Sennheiser Momentum range. With over-ear, on-ear, in-ear, and wireless models available, there's seemingly a set of headphones for everyone. But what should we expect from the company's first completely untethered Bluetooth earbuds? 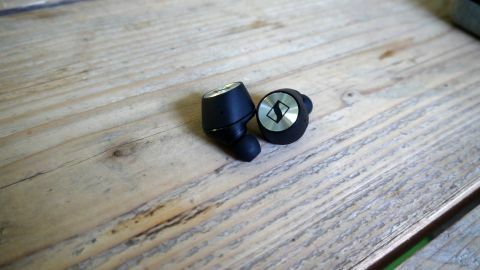 Though conventional wisdom has long placed limits on what can be achieved with headphones' more compact, in-ear counterparts – or over a wireless Bluetooth connection – the Sennheiser Momentum True Wireless earbuds look to continue the company's audio heritage within those physical constraints. When we first tried out the earphones at IFA 2018 we were immediately impressed by the quality of both the audio and the craftsmanship that had gone into these compact, untethered earbuds. But at £259 / $299 / AED 1,249 (about AU$400), these true wireless earbuds are far from cheap. So are they worth the asking price? Read on for our full review of the Sennheiser Momentum True Wireless earphones. The Sennheiser Momentum True Wireless earbuds are the company's smallest offering yet, doing away with the neck cable on the Momentum Free earbuds, and packing in a brand-new 7mm driver to boot. They carry the classic silver detailing of other Momentum earphones, with a pleasing pattern of magnetic gold points that connect each earbud to the accompanying carry case, securing them in place with a satisfying click. The Sennheiser Momentum True Wireless earbuds can only carry four hours of charge, but the charging case is able to carry two full charges for each earbud, giving you 12 hours in total – while the compact USB-C carry case is highly practical for transporting and charging on the go. The silicone earbuds are predictably lightweight, and easy to place in your ears, and they’re certainly comfortable enough to wear, even if the boxy shape and lack of rubber wing tips don’t help matters. You get three ear tip sizes in the box, and finding the right fit is crucial in order to prevent them from falling out. These are earbuds for the commuter, really. While we found they stayed in well enough for light exercise, there’s a limit to what you can do to prevent true wireless earbuds from falling out. If you’re looking for earbuds that will survive your circuits training or ultra marathons, you probably want something made with that activity in mind. The touch controls are intuitive – you use a simple tap on the left earbud’s metal plate to pause/play, or a double tap to skip a track. Holding a finger on the right or left earbud turns the volume up and down respectively. It all works well, circumventing the fiddly nature of cable-line controls or having to constantly get out your phone, though prodding audio kit into your ears all day isn't a recipe for comfort. We would have liked the ability to change the rate at which the volume increased or decreased too – we sometimes found ourselves struggling to time how long to hold down the volume control, and slowing things down a notch would have helped with this. But things get really hands-free with the Sennheiser Momentum True Wireless’ smart capability. By tapping on the right earbud you can activate your phone’s smart assistant – Siri, Google Assistant, and the like – to navigate your music library or streaming apps with just your voice. So how do the Sennheiser Momentum True Wireless earbuds perform? As we’d expect from the brand, the audio doesn’t disappoint. The usual high-standard sound profile of the Momentum range is here, with the boost from Sennheiser’s new 7mm driver resulting in a controlled, capable audio performance beyond what you might expect from 'true wireless' earphones. It’s not as wide a soundstage as we’d like, and some of the low-end frequencies can muddy into each other slightly – when listening to Paramore’s Misery Business (as we do, on repeat) the True Wireless could struggle to distinguish between percussive instruments. You won’t get the head-banging bass of Beats headphones, either. Mid and high frequencies are wonderfully balanced though, with detailed vocals that draw out Hayley Williams’ pounded syllables and intakes of breath between notes. The Momentum True Wireless earbuds sound natural, and will suit just about anything in your music library, even if they favor mid-range instruments and vocals over weightier sounds of house music, or drum and bass. The Transparent Hearing feature, which records outside noise and then transmits this into your ears to keep you aware of your surroundings, is somewhat useful – but the sound isolation on these small earbuds isn’t really enough to block out the noise around you anyway. You may find the feature puts you at ease when walking in busy places, but it makes only a small difference to what you can or can’t hear. With stylish design, smart controls, and professional sound, the Sennheiser Momentum True Wireless earbuds are a fantastic cordless alternative for those who aren’t fans of trailing cables or wired remotes. For an iPhone user, it's hard not to recommend the Apple AirPods instead – they're almost half the price, after all – or one of the cheaper options on our list of the best true wireless earbuds. But the Sennheiser Momentum True Wireless earbuds still offer premium audio in a smart and well-designed package. While these earbuds are far from the first true wireless examples we’ve seen, they’re some of the most accomplished in their category. A Sennheiser representative admits the company has been "late to the market", but for those who can afford the brand’s first ‘true wireless’ buds, it may have been worth the wait.